Click to View Enlarged Image Take a good look at this picture. It's one of the most remarkable photographs ever taken. The tiny hand of a fetus reaches out from a mother's womb to clasp a surgeon's healing finger. It is, by the way, 21 weeks old, an age at which it could still be legally aborted. The tiny hand in the picture above belongs to a baby which is due to be born on December 28 . It was taken during an operation in America recently. It is a medical development in the control of the effects of spina bifida ... and on a picture which will reverberate through the on-going abortion debate here. Your first instinct is to recoil in horror. It looks like a close-up of some terrible accident. And then you notice, in the center of the photograph, the tiny hand clutching a surgeon's finger. 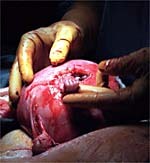 Photo: While undergoing spina bifida surgery in utero, 21-week-old fetus Samuel Armas grips the finger of Dr. Joseph Bruner through the incision. It shows a 21-week-old fetus in its mother's womb, about to undergo a spine operation designed to save it from serious brain damage. The surgery was carried out entirely through the tiny slit visible in the wall of the womb and the 'patient' is believed to be the youngest to undergo it. At that age the mother could have chosen to have the fetus aborted. Her decision not to, however, led to an astonishing test not just of medical technology, but of faith. So, on an unborn patient no bigger than a guinea-pig, the operation was performed without removing the fetus from the womb. Then, at 14 weeks, she started to suffer terrible cramp. An ultrasound scan was carried out to show the shape of the developing fetus and its position in the womb. When the picture emerged, it was the moment that every parent-to-be dreads. Their unborn son's brain was mis-shapen and his spinal cord was sticking out from a deformed backbone. He had spina bifida. They were devastated and "torn apart'' said Alex, a 28-year-old jet aircraft engineer. Mr. and Mrs. Armas were fully aware that if anything went wrong, no attempt would be made to deliver Samuel by Caesarean section. Medical science does not yet have the capability to keep a 21-week-old fetus alive outside the womb. The crash-cart was on standby for Julie, not Samuel. The movement posed the risk of sending Julie into labor contractions, which would have been fatal for Samuel. An hour later, the womb is gently eased back into place. "Beautiful,'' said one of the technicians and relief swept the room. Julie was allowed home with Alex within days. The baby is due on December 28 . Many people have written asking what happened to Samuel. Happily, both Samuel and his mother are doing well. Below is the letter that Samuel's mother sent out after his birth. Samuel arrived on Thursday, Dec. 2  at 6:25 pm at Northside Hospital weighing 5 lbs 11 oz and 20 1/2 " long. He was born at 36 weeks but came into the world screaming his head off! 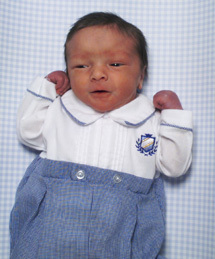 He did not have to spend any time in a neonatal unit and came home with us on Monday, Dec. 6. After viewing an ultrasound of his brain, Samuel's neurosurgeon was very optimistic as he does not have any hydrocephalus and the brain malformation has resolved. He is moving his legs very well from the hips and some from the knees. He was frank breech (folded in half) in the womb and the orthopedist feels that he has a good chance for walking. He will begin physical therapy next week in order to work out some of the stiffness in his legs that was a result of his being folded in half in the womb. He is also nursing very well. Thank you all for your prayers and support. We are happier than we ever dreamed possible!